Larry Lucifer was one of many new members of the Vicious Circle that SkullFace initiated into the group whilst he was leader. 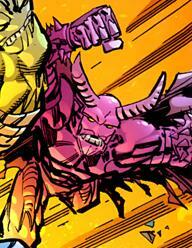 He was present during the raid on the villains’ stronghold by Dragon and an army of heroes to rescue Angel Dragon. Larry Lucifer later took part in the assault upon President Obama shortly after Dragon rejoined the Chicago Police Department.